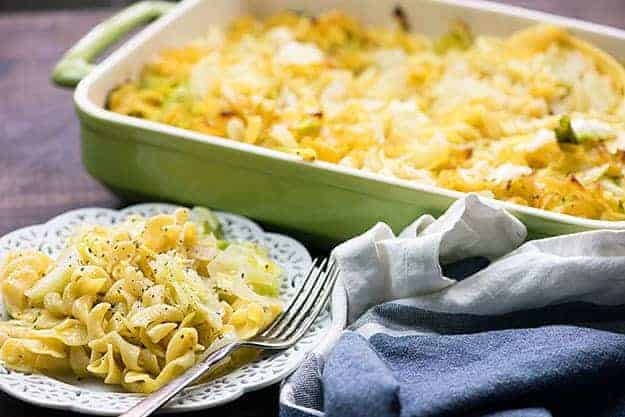 Haluski is a traditional Polish dish made of fried cabbage and egg noodles. It bakes up into a dish of buttery comfort food. My children, like most, are straight up obsessed with noodles. I swear, they would eat pasta every night of the week if I weren’t around to veto their dinner ideas. Don’t get me wrong, though. We eat plenty of pasta. I don’t veto them ALL the time. I’m only human and noodles are life. Buttered noodles (an Amish recipe, so you know it’s good) are a favorite side in this house. Crockpot beef and noodles are always a hit with my kiddos, too. And, obviously, my one pot spaghetti recipe is to die for. 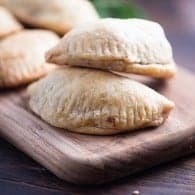 But this haluski recipe? Oh yeah. 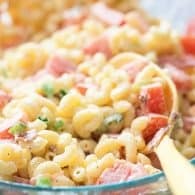 It’s a completely new twist on pasta for us and we all LOVE it! You don’t have to feel quite so guilty eating it, because there is cabbage mixed in. Yeah, it’s all buttery and delicious, but it’s not just straight carbs, so that makes it okay in mind. Right?? First up, you’re going to want to boil some egg noodles. I’ve just used the traditional curly looking egg noodles that you buy in the dried pasta aisle. No need to get fancy here. Next, you’ll chop up some cabbage. I like to keep the cabbage around the same size as the noodle, so that everything combines together nicely. Add some sliced onions to a pot with melted butter and cook them until they’re nice and soft. Stir in a little garlic for good measure. Add a little more butter to the pot along with the cabbage. Cook that up until it’s nice and soft. 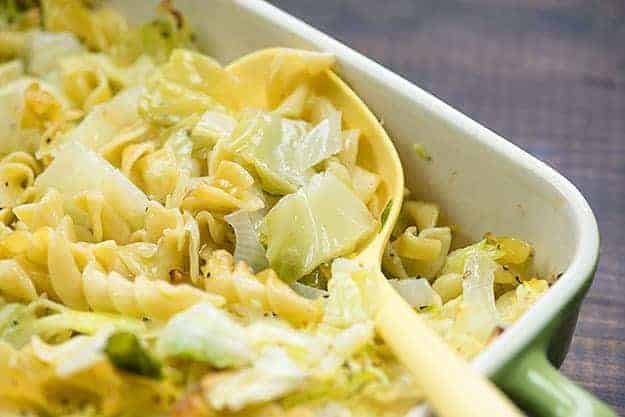 Stir the cabbage and onion mixture into the cooked egg noodles and season. I like quite a bit of salt and pepper on mine. Spread everything into a large baking dish and then cook at 300 degrees for about 30 minutes. 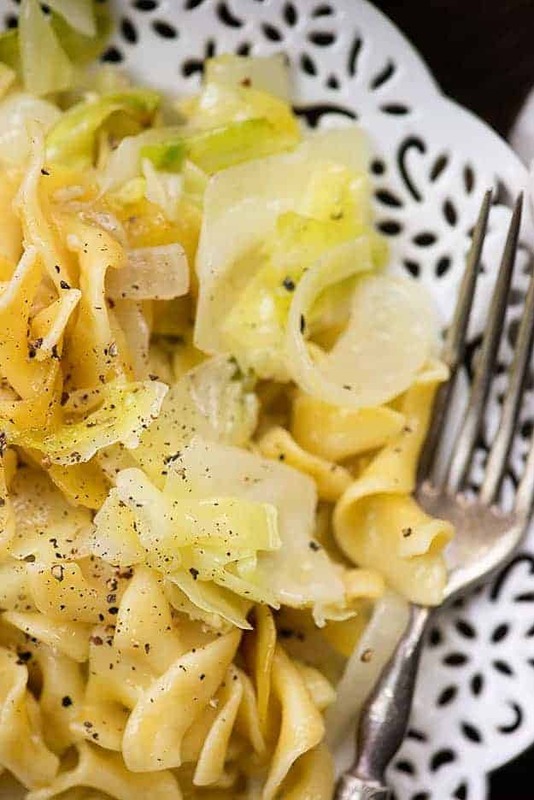 This fried cabbage and noodles recipe is such a simple dish, but for some reason it just works. 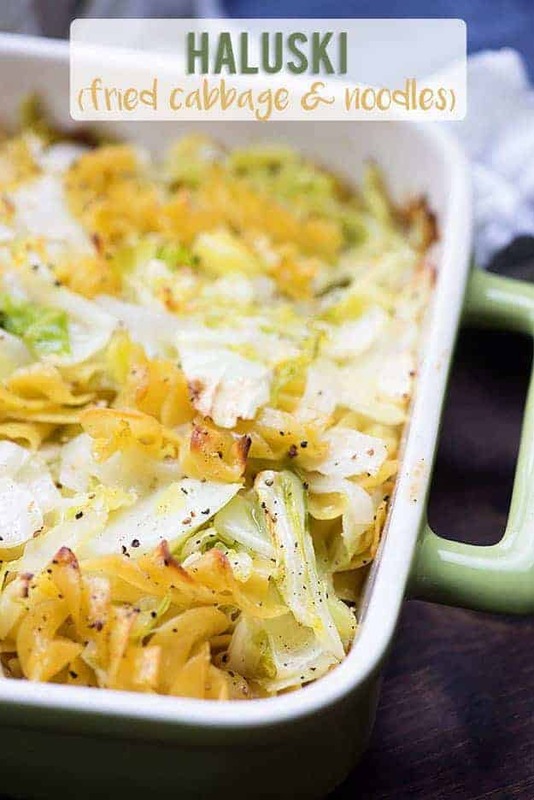 I don’t generally think of cabbage when I think of comfort food, but it’s all so buttery and tasty and warm and just downright good. I bet you’ll love it! Fry up some keilbasa to serve with this and you’ve got a great easy meal! It also goes great with ham. 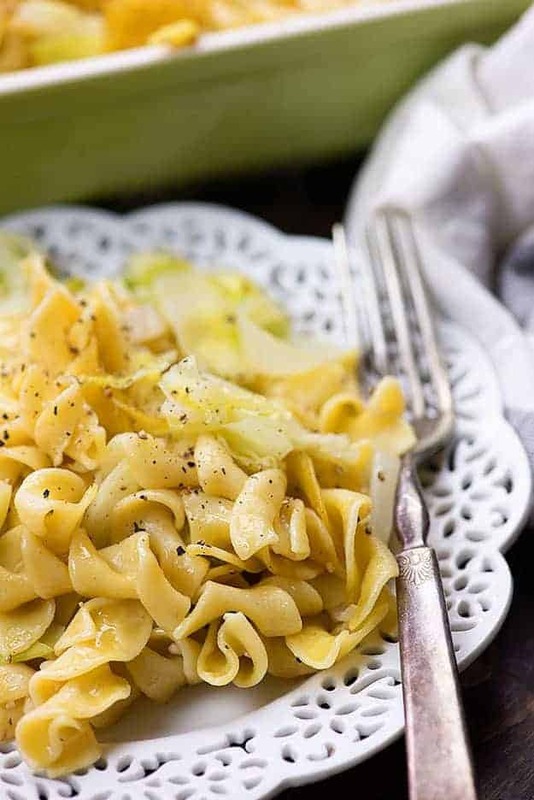 Haluski is a traditional Polish dish made of fried cabbage and noodles. It's comfort food at it's finest! Bring a large pot of salted water to a boil and cook egg noodles according to package directions until al dente. Drain noodles and set aside. Add 1/2 cup of butter to a large dutch oven or deep pot over medium heat and cook until melted. Slice the onion and add to the butter. Cook, stirring occasionally, until onions are translucent, about 5-10 minutes. Add the remaining 1/4 cup of butter to the pot and melt. Chop the cabbage into bite-sized pieces and add to the pot. Cook, stirring often, for 5-10 minutes or until cabbage has softened. Add the garlic and cook for 30 seconds more. Stir the cooked egg noodles into the cabbage mixture. Season well with salt and pepper. Transfer to a 9x13 buttered baking dish and bake at 300 degrees for 30 minutes or until the top is golden brown. My Hungarian Grandmother. Although she fried bacon crisp and added the whole cast iron pan into the bowl of almost cooked noodles, chopped cabbage that was parboiled with quartered red potatoes. Of course chopped onions are included. All of the ingredients are gently blended together then put in a pretty baker and in oven for about 20-25 minutes. A meal in itself accompanied with a salad or yummy Hungarian cucumber salad. 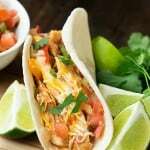 I rarely comment on these recipe blogs but this looks so yummy I will be making it in the next few days. I happen to have all the ingredients already. Thanks! I love your site. This is a wonderfully comforting dish in our house. A friend from Poland suggested I try adding about 1-2 cups cottage cheese to the mixture. I tried it and it is delicious. It is delicious. I am polish also and make this very often. The only difference is I don’t bake mine. What I do is, saute an onion in a stick of butter, chop cabbage, add to onion until cabbage is tender. Boil wide egg noodles, when done toss with the onion n cabbage. And Enjoy. My mother would put a spoon of sour cream on top of hers when eating. Someone else mentioned adding cottage cheese to it and now I have to try that. I bet sour cream is really great too! I don’tbelieve the name Haluski is accurate. This is more Czech or Slovak. The correct name is Kluski, which is a generic Polish language term for all noodle or potato-type dishes. Your point? A rose by any other name would smell as sweet. Bernadette is right, this dish is not Haluski (or really Ha?uski). Haluski are more like big potato gnocchi or dumplings (because there is no direct translation). In Polnd we would rather that it is macaroni with cabbage. 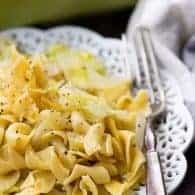 While it is a great recipe and tasty dish it just has a different name and it is called kluski z kapusta (noodles with cabbage) or lazanki z kapusta (where you use sour cabbage, wild mushrooms and noodles made from the same dough as pierogi wrappers). I thought Kluski was type of noodle. My Hungarian Grandma made all of the noodles for any of the noodle dishes. My Slovak mother and grandmother (Baba) used to make this all the time. It wasn’t baked either. Just served after combining all ingredients. They also used to make noodles and cottage cheese, with a little browned butter on top. It tasted a lot like fettucini alfredo. When they didn’t make their own noodles, they used Kluski brand noodles. Just reminiscing over childhood food. Oh, and then there was the nut roll and poppy seed roll. I really have to try this with cottage cheese! I have my moms recipe for for those. If you would like, e-mail me at [email protected]. And I will give it to you. I made this yesterday, and we absolutely loved it! Even my sister, who likes neither noodles or cabbage, ate every bite. It will become a permanent part of my culinary repertoire. I see that someone above used bacon, I’m definitely trying that. Loving this blast from my roots. As a Russian, I grew up thinking of cabbage as comfort food – so this isn’t out of my comfort zone at all! I could eat pasta every day! This looks so delicious and so affordable too! Love the simple ingredients in this dish. Thank you for sharing! Noodles are indeed life! I haven’t had this dish in years and years. I need to change that soon! My Jewish mother made a similar dish, also with cottage cheese. 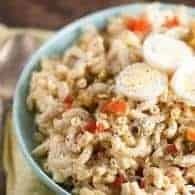 I tried this dish with 2 cups of cottage cheese and it was to die for!! Thank you for the recipe !! 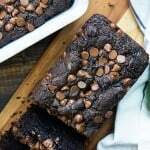 This is the best Recipe I have found !!! I cannot believe I was finally able to make it myself and it be exactly what I was hoping for and more!!! so thank you so much for sharing this as it was absolutely perfect!